Starvation of the body is due to not getting enough of proper nutrients. It can occur from eating too many empty calories or from not eating enough healthy foods. The symptoms of starvation can come on slowly over a period of days, months or even years. You don’t even have to feel hungry to experience starvation. Even if you eat regularly, starvation can occur if it isn’t the right kind of food. It is really important to feed the body enough of the right foods for good health and growth. 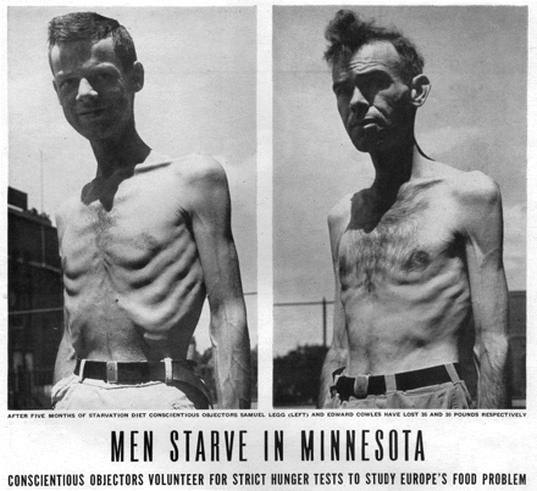 This article explains how starvation happens, the symptoms, and treatments. The beginning stages of starvation impact your mental status and behaviors. These symptoms show up as irritable mood, fatigue, trouble concentrating, and preoccupation with food thoughts. People with those symptoms tend to be easily distracted and have no energy. As starvation progresses, the physical symptoms set in. The timing of these symptoms depends on age, size, and how healthy you are. It usually takes days to weeks, and includes weakness, fast heart rate, shallow breaths that are slowed, thirst, and constipation. There may also be diarrhea in some cases. The eyes begin to sink in and glassed over. The muscles begin to become smaller and muscle wasting sets in. One prominent sign in children is the belly begins to swell. Skin will loosen and turn pale in color, and there may be feet and ankle swelling. Symptoms of starvation may also appear in other areas such as weakened immune system, slow wound healing, and poor response to infection. You may notice rashes on the skin or wounds that don’t heal. This is because your body is directing any nutrients available to just keeping organs functioning. You can also suffer from starvation if you are not eating the right kinds of food. Eating empty calories most of the day for days in a row such as just snacking on chips, cookies, or candy, eating fast foods meal after meal, eating too many processed foods and not enough fresh foods may as well cause starvation symptoms to occur. When meals are skipped, the body begins to maintain its own blood sugar levels by production of glycogen in the liver and breaking down stored fat and protein. The liver can only provide glycogen for the first few hours. After that, the body begins to break down fat and protein. Fatty acids are used by the body as an energy source for muscles, but lower the amount of glucose that gets to the brain. Another chemical that comes from fatty acids is glycerol. It can briefly be used like glucose for energy, but eventually runs out. Phase two can last for up to weeks at a time. In this phase, the body mainly uses stored fat for energy. The breakdown occurs in the liver and turns fat into ketones. After fasting has gone on for one week, your brain will use these ketones and any leftover glucose. Using ketones lowers your need for glucose and your body slows down the breakdown of proteins. By this point, the fat stores are gone and the body begins to turn to stored protein for energy. This means it needs to break down muscle tissues which are full or protein. The muscles break down very quickly. Protein is essential for our cells to work properly, and when it runs out, the cells can no longer function. The cause of death due to starvation is usually an infection or other result of tissue breakdown. The body is unable to gain enough energy to fight off bacteria and viruses. The signs at the end stages include: hair color loss, skin flaking, swelling in the extremities, and a bloated belly. Even though they may feel hunger, people in the end-stage starvation are usually unable to eat enough food. Prevention of starvation requires eating nutritionally-dense meals at regular intervals. For those who refuse to eat, they may need more intense measures like therapy and spoon feeding. Problems with obtaining food need to be addressed and in rural areas and farmers can be given free seeds to plant food. This helps increase the amounts of food and bring down the price so people can afford to eat properly.